Potassium nitrate blocks the nerve that carries the message of pain to the brain due to sensitivity. 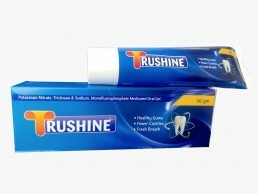 This protects the tooth and prevents the feeling of pain when eating and drinking. Triclosan is an anti-septic substance which kills odour producing bacteria in the mouth and also prevents the formation of plaque. Sodium monofluorophosphate protects tooth enamel from attack by bacteria that cause dental caries (cavities).